During the teaching, Gyalwang Karmapa explained that three topics had been suggested: the lama- disciple relationship, consciousness and wisdom [to link in with Thrangu Rinpoche’s teachings] or a topic of his own choosing. His Holiness covered all three in nearly two hours of teaching to a packed shrine room! Gyalwang Karmapa began by reprising a theme consistently highlighted in his teachings: the Dharma has to be brought to bear on every part and moment of our lives. In the context of the twenty-first century, it seems that from one perspective there have been great advances in science and technology, yet, according to the Buddhist scriptures, the twenty-first century is predicted to be a time of the five degenerations, a time when sentient beings have many coarse afflictions and negativities, and particularly a time when people hold many wrong views. Reflecting on life in the twenty-first century, it seems that, as people become busier and busier, there is increasing danger of their being distracted and not having opportunity to search for happiness within themselves. The students gathered at Vajra Vidya Institute have had the great fortune to attend Thrangu Rinpoche’s teachings. However, having listened to teachings, we need to practice the meaning of the Dharma, and this we do in two ways: first, we make a special time to do our practice; second, at other times, we keep thoughts of the Dharma continuously in mind. Forgetting the Dharma immediately after we finish our practice session is not correct practice. Moving on to the lama-disciple relationship, Gyalwang Karmapa first considered how to serve the lama. He emphasized that lama and disciple needed to be of the same mind—the ways we serve the lama should always be in harmony with the lama’s intentions. We should do what the lama tells us to do. If we make our own decisions about the best way in which to serve the lama, and they are inconsistent with the lama’s intentions, we are not serving the lama’s purpose. Gyalwang Karmapa drew on the life of Milarepa to illustrate his point, and Marpa’s refusal to instruct Milarepa in the Dharma. However, this is understandable if we reflect on the nature of the secret Mantravajrayana which contains profound instructions and empowerments that should not be given to people who lack the capability or merit. For the lama it can be difficult to refuse when a student requests an empowerment or instructions. Perhaps this is why lamas in the past set their students difficult tasks such as acquiring gold. Accomplishing the task proved that the student was wholeheartedly committed to Dharma practice. In addition, the student has to be ready, and the instructions or empowerments have to be given in a way in which it can be received. Milarepa, for example, devoted his whole life to practice of the Dharma, and in this way he was able to genuinely serve his lama and accomplish the lama’s words. Serving the lama does not mean being at their side all the time. Rather it includes thinking about their words and intentions, and serving them in that way. Student need to prepare themselves for serving the lama by developing excellent intentions and activities. It is never certain how or if the lama will give instructions. Naropa spent many years with Tilopa without receiving any formal instructions, but received many teachings in a practical way. Whenever the lama teaches us something it has to be at the level and intentions of our own thoughts and we have to be able to put it into practice. As to the relationship between lama and student, you have to feel it within your own being. 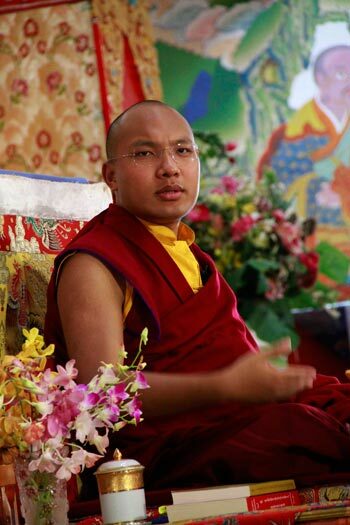 Thrangu Rinpoche’s recent teachings were based on the Third Karmapa’s Distinguishing Consciousness from Wisdom , so the Gyalwang Karmapa next shared some thoughts on consciousness [namshe] and wisdom [yeshe]. In Vasubandhu’s Treasury of Abhidharma it says in the root verses that mind, consciousness and cognition are the same meaning. In the Vaibashika [Exposition] School and in the Sutra School it is said that mind, consciousness and cognition are all the same. Then there is the sixth mental consciousness which is not divided into the subtle and coarse aspects of the seventh and eighth consciousnesses. In the Mahayana scriptures, especially those of the Vijñ?ptiv?da [Mind-Only School], there is a differentiation between mind, cognition and consciousness. Mind is the ground consciousness. Cognition is the afflicted mind. Consciousness refers to the six consciousnesses [five sense consciousnesses and the mental consciousness]. Thus there is a division into coarse and subtle aspects. Of course, the ground consciousness is a consciousness but with respect to differentiation between mind, cognition and consciousness it is termed ‘mind’; it is a subtle differentiation. The five senses and the sixth mental consciousness are not stable, they’re transient, so they cannot collect the imprints. Similarly, the seventh consciousness, the afflicted mind, is not always present—there are three situations when it is absent—so it also cannot collect imprints. The alaya or ground consciousness is the most stable; it is continuously present from the beginning of sentience through to awakening as Buddha, and hence is called the ground of imprints. In terms of karma, cause and effect, previous lives create imprints which are carried forward from one life to the next. There are different positions on this. According to the Summary of the Mahayana, the ground consciousness is the basis which goes from life-to-life, and the imprints awake and ripen. The ground consciousness is said to have many different features. Asanga’s Summary of the Mahayana posits that when the ground consciousness is transformed at the point of enlightenment, it ripens, and thus refers to it as the ripening consciousness. Whereas Abidharma / Abhidharma-samuccaya says that the ground consciousness is present until awakening. It is also said that at the point of enlightenment it transforms into the mirror-like wisdom. An Indian scholar Yandag Tonpa, posited a ninth consciousness – stainless wisdom–and said that this is the mirror-like wisdom, arguing that if the mirror-like wisdom is a consciousness it has to be different from the other eight. The explanation of the Mind-Only or Vijñ?ptiv?din school is that the ground consciousness is the ground where all aspects of consciousness can happen. Higher philosophical schools such as the Yogacarya Middle Way Schools also describe how conventional appearances occur in terms that fit the Mind-Only presentation. They use the words ‘ground consciousness’ but with a different meaning. 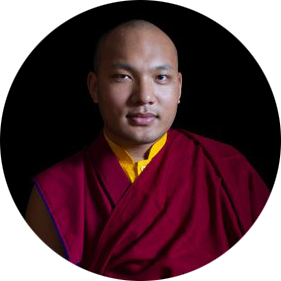 Similarly, the Third Karmapa Rangjung Dorje mentions the ground consciousness [alaya] in his Profound Inner Meaning but uses the term to mean the Buddha nature or the luminous wisdom that is present. So we need to be aware that the meaning of the term ‘ground consciousness’ can change. Basically, within our mind there exists the aspect of clear-awareness. The seventh afflicted mind also has the aspect of clear-awareness. It is as if it has two parts – the aspect of clear-awareness and the part mixed with the afflictions. We gradually purify the part mixed with the afflictions and then the mere clear-awareness remains. Clear-awareness is mentioned in texts on the different classifications of mind. It is also compared to the wisdom of the dharmadhatu, the luminous wisdom of suchness, and so forth. Thus, there are two parts, the part that needs to be eliminated and the clear wisdom part. You can think of them in terms of the part that is to be eliminated and the part that eliminates, or as impure and pure. When the impure part is eliminated the pure part becomes manifest, so in this way we have consciousness and wisdom. The seventh afflicted mind has this pure part – the clear, knowing part. This is the aspect of clear awareness present from the beginning of sentience until Buddhahood. As we go through the progression of removing and cleansing, that pure aspect of our minds is gradually revealed. In Mahamudra we say that thought is dharmakaya. That’s a little strange because it seems that if it’s true, there is no need to awaken to Buddhahood. What it actually means is that the essence of the two is indivisible; In one mind or cognition there are both pure and impure aspects, and the essence of these two cannot be separated. It is not as if there are two different substances. It’s not a question of getting rid of the impure substance and then you get the pure substance, but rather that as you eliminate the impure, the pure is naturally revealed. The ground consciousness is the store of imprints, which are accumulated by the thousands each day, both virtuous and non-virtuous. It is impossible to identify all of these imprints, so it is impossible to rid ourselves of the negative imprints one by one. However, the afflicted mind has the four different afflictions which form the root of the afflicted mind: craving, view, pride and ignorance. And of these, the root affliction of the afflicted mind is the view – the view of a self. If this can be eliminated, we will have eliminated the root of all the others. The antidotes used to uproot this clinging to a self are therefore the most important because they are the antidotes to all other afflictions. If you cut down a tree at the base of the trunk, all the branches are naturally cut down too. We have collected imprints since beginningless time so it would be very difficult to remove each one-by-one. The Exposition School and the Sutra School say that there are external objects, which are the objective condition. The Sutra School maintains that they are the aspects and images that occur because of the imprints arising in our mind, but they say this can only happen if the external condition of the object exists. An appearance is based on both external and internal conditions. In contrast, the Mind-Only School says that appearances are based on the awakening of the imprints. For example, a single blue flower; if ten people look at it, there will be ten different perceptions, its colour, its shape,its aesthetics, and so forth, because each has their own different imprints. There are virtuous and non-virtuous imprints in the continuum of our mind. Whenever we do something virtuous, the imprint is stored and we become habituated to that action, so through Dharma practice we try to make good imprints. For example if we practice generosity in this life, it makes a good strong imprint in our mind-stream and in the next life we will have food, clothing and so forth. Imprints govern our perception of the world. If two people meet Mr Tashi, each will have different perceptions of Mr Tashi because of the appearance which arises due to the ripening of their own imprints. There are not two separate Mr Tashis. Likewise, when we perceive things, it seems as if there is a solid object, separate from our mind, proven and truly existent out there, but when we think about how it really is, we have many misconceptions about this object, how it is or isn’t, and these are appearances dependent on the imprints in our mind. This leads to many difficulties in our lives. We should consider these differences in philosophical views and presentations as a progression, with each Buddhist philosophical school looking inside themselves, and gaining more and more profound understandings of how our minds are. Yet, they all share the aim of providing the path through which we can tame our own minds. They should be integrated into our practice. When we study treatises, this should be our aim too, linking philosophy with practice, turning our attention inwards, helping us explore the nature of ourselves, and then it becomes the establishing the view of Buddhism. Otherwise, if philosophy remains outside ourselves, it will be difficult to fully understand or realize the view. We have to look deeply into ourselves, and turn our intention inwards so that we can experience the nature of our minds. Referring to the recent Japanese earthquake and explosion at the nuclear reactors, the world financial crisis and weakening economy, people were paying a lot of attention to external things. At a time like this it is important to know where to look for happiness. Gyalwang Karmapa emphasized once more that we should not base our happiness on external circumstances; happiness is internal, we can find it within ourselves, within our own minds. What do the words ‘wisdom’ and ‘consciousness’ mean? In Tibetan the word yeshe– means primordial wisdom, that is, knowing the nature of all things from the very beginning, and the word namshe means consciousness, knowing the outer aspect, the appearance, and there are so many confused, fictitious appearances. Gyalwang Karmapa then told a story from the life of the Lord Buddha to illustrate the difference. Once, when Lord Buddha was on his alms round, he arrived at the house of a particularly disagreeable householder who became very angry when he saw him. “You monks are always a nuisance, coming round asking for food,” the householder ranted, and stood berating the Lord Buddha for a considerable time. Lord Buddha waited patiently, not saying anything, until finally the householder stopped. “You have said many angry and harsh things. Now I have a question for you,” said the Buddha. “Give it back,” said the householder. Consciousness looks at the outer aspect. We are fooled by how things appear on the outside, the householder is in the wrong, and so feel we need to respond, so in this situation, we might become angry. That’s the work of the consciousness, based on external appearances, but in fact the incident is a collection of transient conditions and circumstances. So remember, in situations when you might get angry, don’t be overcome. Concepts such as ego-lessness are taught to help us, but some people get even more egoistic when they study these philosophical topics! Likewise the teachings on the ground consciousness are taught in order to show us how karma, cause and effect, are not dissipated over time. Instead, they go with us from lifetime to lifetime to lifetime. If you forget that all these philosophical ideas are there to help us tame our own minds, you can become very skilled in philosophical debate, but you will have missed the point.